New Youth Program Classes!Starting now! First class is free! Bring your child for a trial class. If you would like to register for class, please either call the office at 646-230-9564, email Susan Hebach at shebach@atdf.org, or arrive at the studio about 15 minutes before class to register! Summer 2010 Tap Camp for Kids! 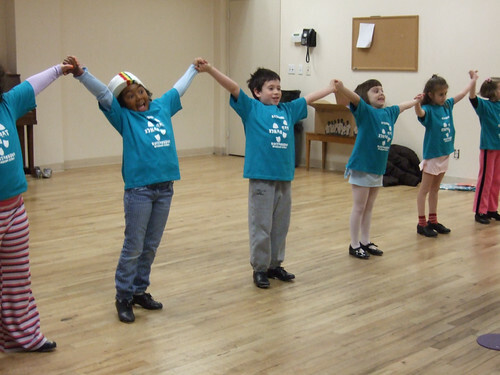 For the first time, the American Tap Dance Foundation will be offering a camp designed especically for the young tap dancer or aspiring tap dancer with no experience to 3 years of experience. Call 646-230-9564 or e-mail crunft@atdf.org to reserve your child's space now! DROP-IN classes - start at any time! More information posted! Visit: Tap City for details. Visit: Sound Check for more detailed information as well as how to purchase tickets! PROGRAM: NYC's most creative dancers with innovative music! The work will interact with the changing instiallation, "Sticks amd Stones", a site-specific art installation by Jo-Wood Brown. Pam Koslow - one of the producers on this new show! Here is your chance to see Yank! A World War II Love Story and benefit ATDF at the same time. For every ticket sold using this unique ATDF code below, Yank! A World War II Love Story will donate $13 to ATDF. Buy your tickets today. Set during World War II, Yank! chronicles the relationship between two servicemen long before "Don't-ask-don't-tell" was part of the national discussion. With a lively score inspired by the pop sounds of the 1940's, Yank! captures the spirit and exuberance of the era as it explores questions of prejudice, courage and survival. An homage to Hollywood's "it-takes-one-of-every-kind" platoon movies and to 1940s Broadway. It tells the story of Stu-a photographer for Yank magazine-and Mitch, an Army Private, who fall in love and struggle to survive in a time and place where the odds are stacked against them. For show information, visit YorkTheatre.org. with $13 per ticket going to ATDF! * Offer not valid in conjunction with any other offer or on previously purchased tickets. Subject to availability and prior sale. All sales final. No refunds or exchanges. Offer may be revoked at any time. Blackout dates may apply. Valid for performances through March 21st. WHERE: Barnes & Noble Lincoln Square: 1972 Broadway. Tap2You: Bringing New York City Tap To You! Tap2You was created as a way to educate people about tap dancing, and is a new kind of dance competition. Instead of rewarding bigger, faster and flashier tap routines, Tap2You is about rhythm, musicality and timing with a strong focus on performance and education. Founders, Derick Grant and Aaron Tolson, invite you to be apart of this inaugural event in Lowell, MA. Join us as we build the bridge between the competition world and the professional tap community. Karen Callaway Williams Kids Tap Books! WHERE: Symphony Space - Leonard Nimoy Thalia, 2537 Broadway at 95th St. Underground tap-dance icon Roxane Butterfly, the only woman tap dancer to have received a Bessie Award, is joined by a stellar cast of tap greats to pay homage to her mentor, tap-master Jimmy Slyde. While you watch the show, enjoy a glass of wine and a light evening meal in the intimate cabaret atmostphere of the Leonard Nimoy Thalia. TICKETS: Click here for discounted tickets - special discount for ATDF e-newsletter subscribers! Looking for tap dancers who are EXCEPTIONAL and have unique performance styles. Something rarely if ever seen before. Groups are preferred. *We are looking for other types of performers as well. Need a video link for consideration. The American Tap Dance Foundation, Inc. would like to thank the following for their generous support: Our Anonymous Angel, the National Endowment for the Arts, the New York Department of Cultural Affairs, New York State Council on the Arts, American Express, The 42nd Street Fund, the Tsunami Foundation, the Heckscher Foundation for Children, The Jerome Robbins Foundation, and numerous individuals, friends and families.